24,901 miles. 40-some-thousand kilometers. That’s one big girdle! 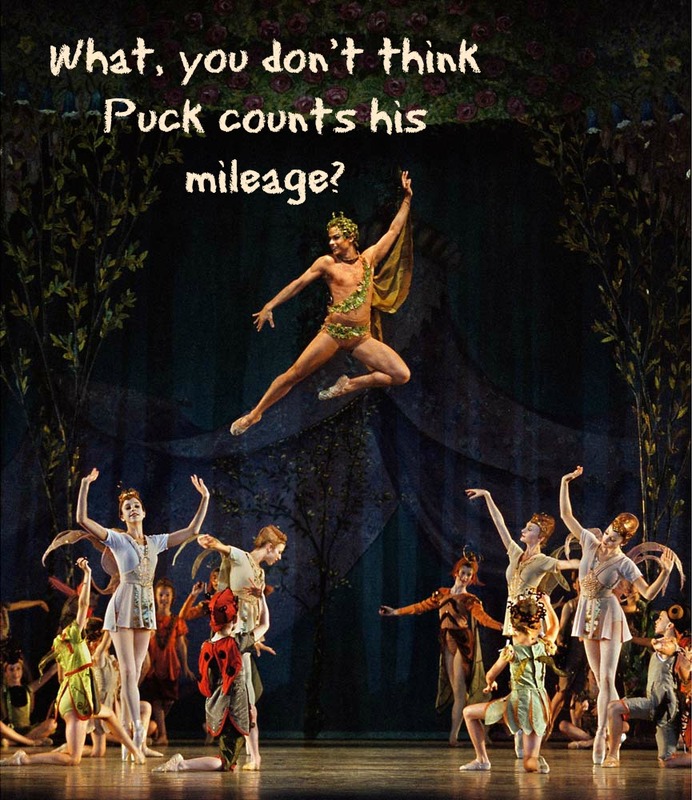 Puck (in Shakespeare’s Midsummer Night’s Dream) got the job done in 20 minutes, seeking out that famous love-potion flower. ...Voilá! Le grand total: 75,000 miles and counting. My secret? Not marathons. NO WAY. Never ran one of those, never plan to. Watched both my parents training for ’em as I grew up, and that cured me of any desire to suffer ridiculously for three-plus hours run one. No super-long runs either. The longest races I’ve ever run were good ol’ 10ks (6.2 miles); the longest training run, 15 miles, and that only once. It sure wasn’t my idea to start running as a 3rd grader. My dad, a scientist, was one of the original Health Nuts of the late 1960s, and when he learned that running improved your cardiovascular system, it therefore followed that NOT running would lead to an early grave, right up there with eating hot dogs. So we became a family of runners, by paternal decree. My sister and I used to run down our country road in North Carolina for our little 2-milers, sneak into the woods, check our watches till enough time had elapsed, then run home, panting heavily. Let’s just say I was no Zola Budd, bounding around like an eager gazelle. But…I was fast. Put me in a couple of races…I beat people. I beat GROWNUPS. I loved that. I loved medals and ribbons and later, trophies. I kept running, and training, but for the wrong reason: ego. Except that ego kept me in the sport. And, like early religious training, that depth of immersion causes a certain amount of internalization–swallowing the river water in which you’re baptized, so to speak. My river was FITNESS. And 45 years later, I am truly grateful to my dad for doing that to me. Sure, I had my years of rebellion. In college I walked off the track team…in the middle of a race (not proud of that). In my 20s I quit again, gained weight, decided I liked myself better as a runner, came back to it more seriously than ever. I also gave up racing in my late 30s, tired of fighting a painfully persistent hamstring injury. But now, in my 50s, I still run. Not every day. These days, in fact, my mantra is “A mile’s a mile.” That means I can walk or hike or jog at any pace and it still counts as mileage. It just might take longer. (OK, strolling through a museum doesn’t count. Note to self: look up WHY STROLLING THROUGH A MUSEUM IS SO FRIGGIN’ EXHAUSTING EVEN WHEN IT ISN’T BURNING ANY CALORIES.) I’ve even worked out my own cool little equation to compare miles on a bike to running miles. Because, yup–I’m still counting. Workin’ on that fourth girdle. How about your own sports history? Were you raised with a sport that saw you through? Have you had to invent yourself as an athlete? Do you have a sport or fitness activity that you rely on every day? What does that sport do for you? Let us hear! 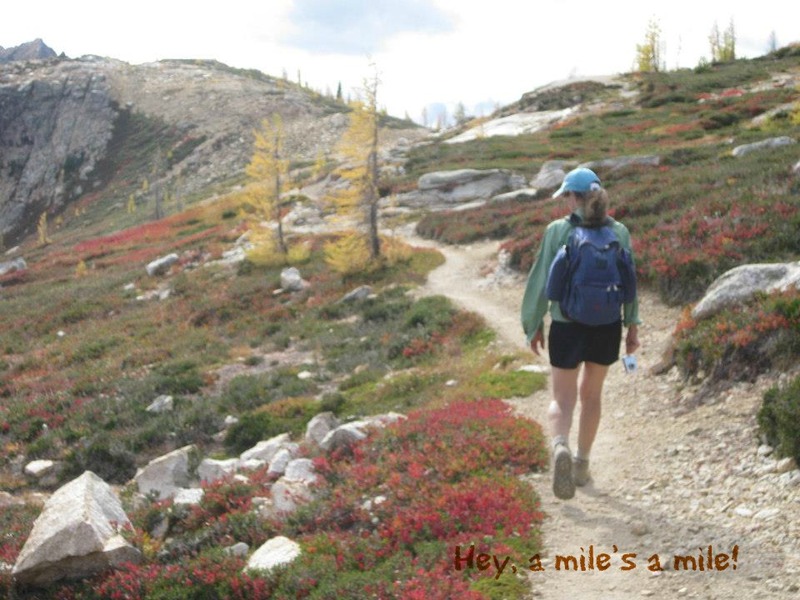 This entry was posted in Wing's Words and tagged fitness, marathons, running by gretchenwing. Bookmark the permalink. I am also a runner – ran a marathon once and even worked for The New York Road Runners Club as their librarian. I love it because it’s not competitive – I can go at my own pace and it helps me fight stress. I’ve been running for thirty years -still have trouble climbing up subway stairs!